McDonald’s will be giving away free McDonald’s McMuffins next week, Monday, March 17,2014. Yes you read it right: FREE McMuffins next Monday March 17,2014 starting at 6AM. Thank you for awesome mornings! Have a FREE McMuffin! Checking McDonald’s Philippines Official Website, I confirmed this is a real deal!!! Just like last year, McDo will be celebrating the biggest breakfast event ever next week, the “National Breakfast Day” all over the Philippines. 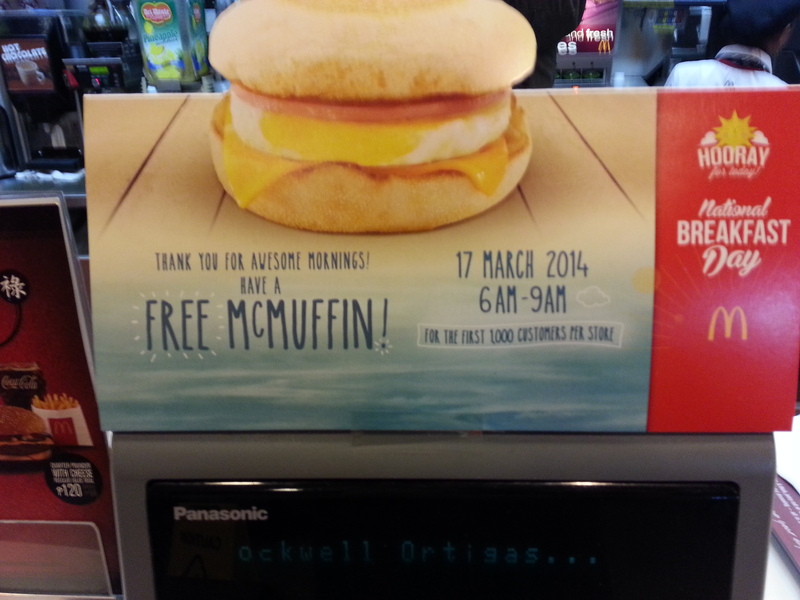 Free 315,000++ McMuffins! Wow!!! On its second year, McDonald’s will be celebrating the biggest breakfast activation by serving more than 315,000 McMuffin sandwiches to customers all over the country. On March 17, 2014, starting at 6:00 AM, all participating McDonald’s breakfast stores nationwide are joining the celebration to say “thank you” to its customers who start their day at McDonald’s. Each participating McDonald’s breakfast store will be giving away free McMuffins to the first 1,000 customers at a first-come-first-serve basis – that’s over 315,000 hot and fresh McMuffins to be given away nationwide via Dine-In, Take-Out, and Drive-Thru. For complete list of participating stores, click here. Coupons valid between 6:00am to 9:00am on the same day only. Only one (1) coupon will be given per customer. Coupon is not for sale. Once customer has surrendered the coupon at the counter, his/her hand will be stamped by the crew to validate that the McMuffin has been received and may not be given another coupon. Only one (1) McMuffin can be claimed per coupon. Only one (1) coupon can be redeemed in a single transaction. No coupon, no free McMuffin. Coupon cannot be converted to cash and/or other McDonald’s products. McDonald’s reserves the right to refuse redemption if coupon was found to be tampered with. Only original McDonald’s issued coupons will be accepted. Free product may vary from illustration. 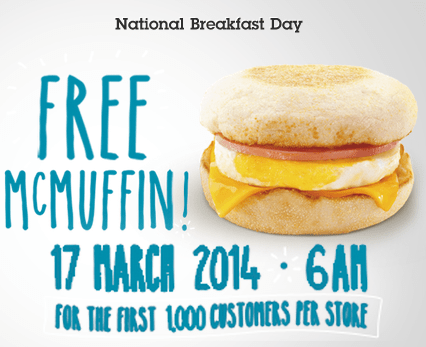 So save the date: March 17, 2014 for Free McDonald’s McMuffins for National Breakfast Day!